13 November/December 2014 Pharmaceutical & Medical Packaging News • pmpnews.com take the transition material and don't change your process, you are fine." And any regulatory submission should be structured to allow the use of either, he added "If you structure it properly, you will be able to use the concept of inter- changeability," he said. The advantages of interchange- ability include ensuring continuity of supply during the transition period, inventory doesn't need to be segre- gated, and it allows for depletion of inventory that exist throughout the value chain, Scholla said. Scholla then provided a regulatory update. He encouraged attendees to engage regulatory authorities now to understand expectations rather than wait until such entities are busy dealing with notifications next year. Leslie Love then posed several ques- tions DuPont has received during the project to Scholla and Van Mullekom and addressed several audience ques- tions. Please view the on-demand Web- cast to hear these questions and answers. Love encouraged attendees to visit www.areyouready.tyvek.com to find a digital MPTP package test results selector tool that will enable MDMs to search for current MPTP testing results by selecting Tyvek style and package design. Additionally a new " M y T y v e k " m o b i l e a p p l i c a t i o n is available to help MDMs access DuPont data and documents from their smart phones and tablets. 0 provide in Puerto Rico," says Dix- on. "We've planned for the cartons we need to do today and then in the future for possible additional products such as inserts and labels." The facility has "ample space" for production growth, with plans to eventually include printing, he adds. It currently does have temperature- and humidity-controlled storage. In addition, "both locations operate on the same cGMP-compliant qual- ity management system," Dixon says. "We've duplicated the system and translated it into Spanish. We also use the same ERP system and the same file-sharing and prepress system. We've got provisions for innovative supply chain solutions such as Vendor Man- aged Inventory and Kanban set-ups." 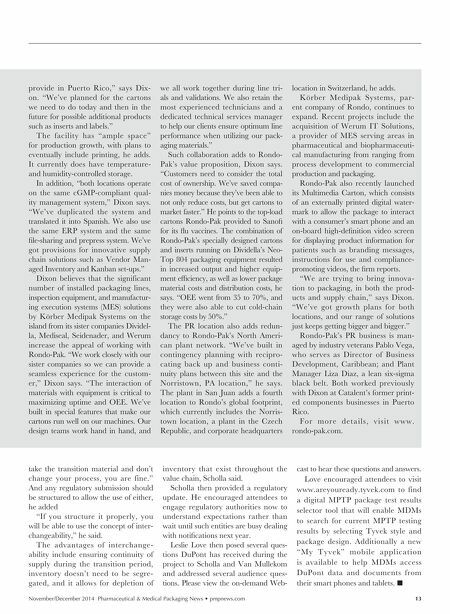 Dixon believes that the significant number of installed packaging lines, inspection equipment, and manufactur- ing execution systems (MES) solutions by Körber Medipak Systems on the island from its sister companies Dividel- la, Mediseal, Seidenader, and Werum increase the appeal of working with Rondo-Pak. "We work closely with our sister companies so we can provide a seamless experience for the custom- er," Dixon says. "The interaction of materials with equipment is critical to maximizing uptime and OEE. We've built in special features that make our cartons run well on our machines. Our design teams work hand in hand, and we all work together during line tri- als and validations. We also retain the most experienced technicians and a dedicated technical services manager to help our clients ensure optimum line performance when utilizing our pack- aging materials." Such collaboration adds to Rondo- Pak's value proposition, Dixon says. "Customers need to consider the total cost of ownership. We've saved compa- nies money because they've been able to not only reduce costs, but get cartons to market faster." He points to the top-load cartons Rondo-Pak provided to Sanofi for its flu vaccines. The combination of Rondo-Pak's specially designed cartons and inserts running on Dividella's Neo- Top 804 packaging equipment resulted in increased output and higher equip- ment efciency, as well as lower package material costs and distribution costs, he says. "OEE went from 35 to 70%, and they were also able to cut cold-chain storage costs by 50%." The PR location also adds redun- dancy to Rondo-Pak's North Ameri- can plant network. "We've built in contingency planning with recipro- cating back up and business conti- nuity plans between this site and the Norristown, PA location," he says. The plant in San Juan adds a fourth location to Rondo's global footprint, which currently includes the Norris- town location, a plant in the Czech Republic, and corporate headquarters location in Switzerland, he adds. Körber Medipak Systems, par- ent company of Rondo, continues to expand. Recent projects include the acquisition of Werum IT Solutions, a provider of MES serving areas in pharmaceutical and biopharmaceuti- cal manufacturing from ranging from process development to commercial production and packaging. Rondo-Pak also recently launched its Multimedia Carton, which consists of an externally printed digital water- mark to allow the package to interact with a consumer's smart phone and an on-board high-definition video screen for displaying product information for patients such as branding messages, instructions for use and compliance- promoting videos, the firm reports. "We are trying to bring innova- tion to packaging, in both the prod- ucts and supply chain," says Dixon. "We've got growth plans for both locations, and our range of solutions just keeps getting bigger and bigger." 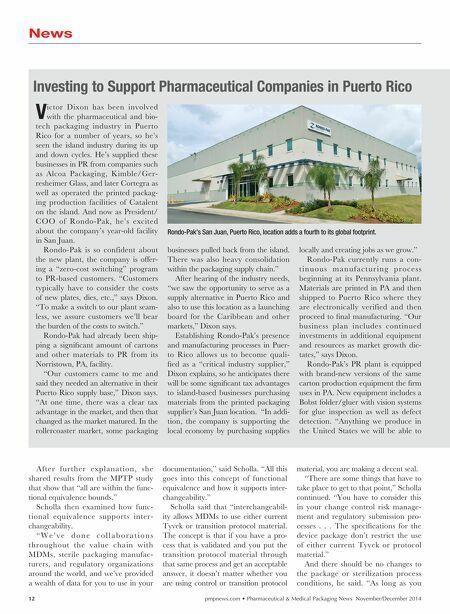 Rondo-Pak's PR business is man- aged by industry veterans Pablo Vega, who serves as Director of Business Development, Caribbean; and Plant Manager Liza Diaz, a lean six-sigma black belt. Both worked previously with Dixon at Catalent's former print- ed components businesses in Puerto Rico. F o r m o r e d e t a i l s , v i s i t w w w . rondo-pak.com.